Preliminary and tender geotechnical design are generally based on conventional calculations related to soil strength usually through limit equilibrium method. This is acceptable in all situations that can be successfully represented by simple geometries and ground conditions. On the other hand, simple elastic or elastic-perfectly plastic assumptions are inadequate when the prediction of displacements, either total or differential, becomes the governing design criterion. A reliable Serviceability Limit State design requires the use of constitutive laws able to reproduce the realistic soil behaviour within numerical models accounting for the complexity of the real soil-structure interaction problems. In order to overcome all the aforementioned limitations, WeSI Geotecnica offers validation and optimization of geotechnical design through numerical analysis. Finite element modelling provided by WeSI breaks the barrier of 2D modelling by taking into account the full three-dimensional geometry of the problem and the real soil behaviour. High-end calculations carried out by the specialists at WeSI Geotecnica support the client with economic yet safe design on the basis of the required performance. 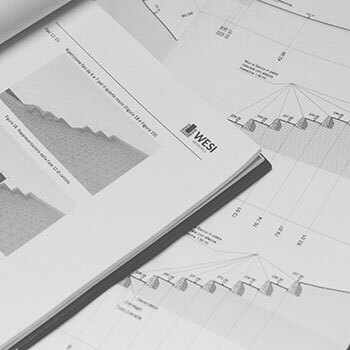 WeSI Geotecnica offers professional design review with on-demand compliance to various international design standards and codes, such as Eurocode 7. Well-performed numerical analysis is the most convenient way to validate geotechnical design where the interaction between various structures is not straightforward, such as in the case of interfering geotechnical structures and pile raft foundations.